Hungarian Jam Filled Crackling Slippers are divine, friable little biscuits or cookies usually made around Christmas time. Every family has their own recipe and sometimes name for this in here and the countries around us. But one thing we have in common, these are taste wonderful for sure! 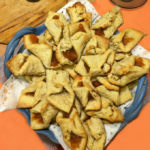 Prepare a stand or hand mixer with dough hooks for this recipe. Dissolve the active yeast in the sour cream. Put the bowl aside to a warm place. Cut the cracklings off the hard skin and with a food processor, ground it. Add the ground cracklings to yeast. Mix the sour cream and the eggs in the mixture. Add the flour and the salt, pepper and start mixing until you get a well-combined dough. Cover the dough and let it rise for about 2 hours. After the 2 hours, preheat the oven and line your baking sheet with parchment paper or a silicone sheet. Roll out the dough on a floured board to about 1 inch thick. Cut the dough into squares (about 3.5") and put a teaspoon of the filling of your choice in the middle of each square. Pinch the two opposite corner of the squares. Line them on the baking sheet. You can brush them with egg wash, but it's optional. Bake them on medium-low heat for 15 minutes or until the bottoms of the slippers are golden, but the top is still a little soft.